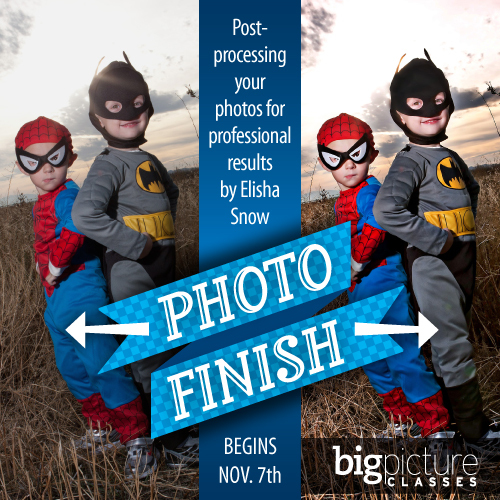 Did you know that probably 99% of professional photographers post-process their photos? Post-processing has dramatically changed over the years. Back in the non-digital age, post-processing meant taking a photo into the darkroom and adjusting exposure, color, contrast and more to get the best photo possible. In the digital world, post-processing means uploading your photos to a computer, opening them in a post-processing program and adjusting little sliders to get AMAZING results! Little changes can have the biggest impact! In this class, you will learn how to upload any digital photo into Photoshop, Photoshop Elements and Adobe Lightroom, and adjust it to get the perfect exposure, color, white balance and more. You’ll learn many post-processing tricks such as smoothing skin, swapping heads, getting the best black-and-white effect, adding texture, creating vignettes, preparing a photo for printing and much more. What this class is NOT: This class is not a digital scrapbooking, hybrid scrapbooking, or graphic design class. The functions of Photoshop are endless and could not possibly be taught in just four weeks. We will stick strictly to processing photos and discussing the basic elements that are important to photography.